Tea and cake; two words often found in the same sentence in many countries. Here in Hong Kong, pastry chefs have approached the culinary centerpiece of the annual Mid-Autumn Festival with contemporary twists for some years. Traditionally, sweet lotus-seed paste and salted duck yolk is encased in sweetened lard-based pastry, similar to the western shortcrust kind to form a mooncake. Fook Lam Moon restaurant, purveyor of high-end Cantonese fare, known for its classic recipes, fine ingredients and highly skilled chefs has been evolving a quiet revolution. Not for this much-awarded establishment are the nouveau components such as glutinous rice or chocolate casings, but both its mooncake pastry and fillings have some fresh additions. This year it launches a smaller custard-filled variety that uses French butter and cream but only a modest amount of sugar; instead of duck egg yolk, it uses lighter salted chicken yolk. Last year, the classic four-yolk and lotus paste recipe heightened its pastry flavour with the inclusion of pu’er tea – which it now continues. On the subject of tea, this year, Fook Lam Moon is suggesting pairings of its mooncakes with premium Chinese teas from respected local label Fook Ming Tong. These combinations are available from August 14 until September 8 through a seasonal Fook Lam Moon pop-up store in Harbour City, Tsim Sha Tsui. Customers purchasing mooncakes here can get advice from a tea master at Fook Ming Tong shop nearby in the same mall. Asian Palate attended a demonstration of these possible pairings, presented by chef Chan Wai-kun, head of the restaurant’s dim sum division and Ann Sit, tea master at Fook Ming Tong. Together they tried over 60 teas before arriving at the final three – one each selected to be paired with the Classic, Signature and Custard mooncakes. The Classic and Signature both incorporate salted duck egg, Chinese olive kernel and eitherwhite or golden lotus paste – the latter is slightly sweeter and richer. Both Chan and Sit said that despite their preconceptions on certain food characteristics best suiting different tea types, several contenders that went together very well. In the end, only the Classic Four Moon Cake was paired with black pu’er – a heavily fermented Yunnan tea, aged for more than 10 years. Eaten with the pastry alone, with its slight caramelization and pu’er infusion, the match offers a rounded taste profile; but while it cuts through the oiliness of the filling, the tea’s dominant earthiness gets a little lost. Upon refilling, the brew strengthens, delivering a slight bitterness, and the balance improves. “A big part of the tea challenge was not to overpower the food but to enhance it,” said Sit. The Signature Duo Moon Cake, with fewer salted yolks and light seaweed sugar substituting rock sugar, is matched with half-fermented Wuyi dark green tea. The prized oolong from Fujian province is fruity, with perceptible mid-palate tannins. Its rich-bodied long finish seems particularly good company with the more flavoursome golden lotus paste version of this cake. Finally, to pair with the new custard filling, Nanyan Supreme Tie Guan Yin, also green and fermented, quite floral both in bouquet and taste, was selected. It matched the filling well – which is more delicate than some egg custard mooncakes released in recent years. 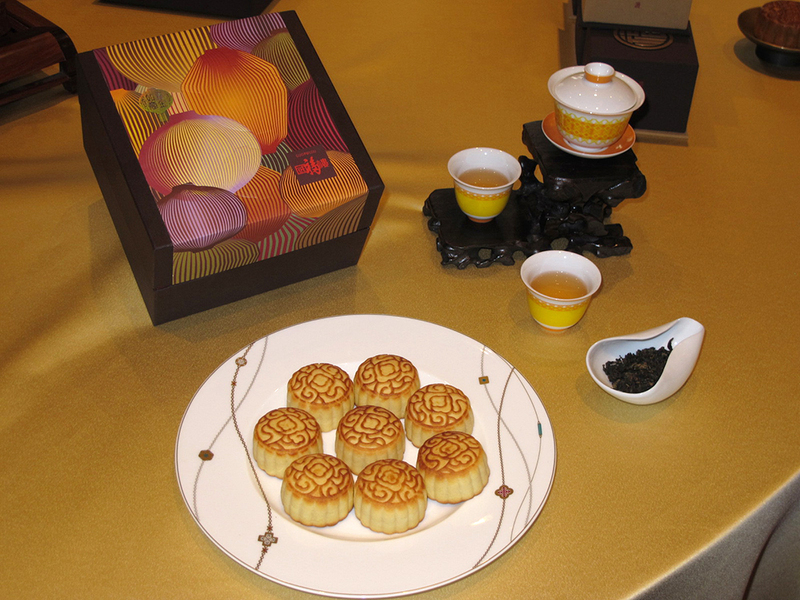 Chan said it was the longstanding combination of aged pu’er with the Classic mooncakes that won him over.